"Eat and beat your way through 150 screens of awesome, nourishing fun and relive the Prehistorik epic in this incredible platform game. Armed with your Diner Club Anticus, proven to be the ancestor of the baseball bat, you start in pursuit of the Hilarious Maxidocus and take on armies of hairy spiders. Explore the virgin icefields of Antarctica, lush tropic jungles, and the dark and mysterious caverns of the shady continent. Don't worry about beatin' and meatin', it's for the good of the T-bone tribe. The hunt for lunch is on; come and get it!" – Ad Blurb. 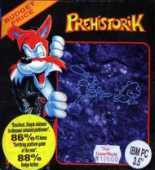 Prehistorik is a solid conversion of Titus' Amiga hit. The game's highlights are the zany humor, inventive levels, and the humorous antics of both your caveman and the enemies. What I like in particular about the game is the many creative weapons you can find and use as well as secret paths that lead to bonus items. 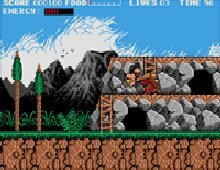 The music is also quite catchy and better than most games of its type (unfortunately, the PC soundfont, as usual, can't compare to the rocking Amiga one). The sequel Prehistorik 2 boasts even better graphics, as well as all-new levels and monsters. It also removes a semi-annoying requirement in Prehistorik that you must collect a certain amount of food before proceeding to the next level. This makes the game more fun, as you no longer need to roam around levels over and over, looking for that one last comestible. Overall, both games are fun "feel-good" platformers that provide just the right level of challenge for the dexterity-challenged (like me), with fun levels that are difficult, but not too difficult to frustrate you. Both are highly recommended! If you like this game, try: Prehistorik 2, Joe and Mac: Caveman Ninja, Ugh!